We stopped at a counter service restaurant called Lakeside Express, which is near Gatekeeper and MaxAir (we did not ride MaxAir since Delirium at Kings Island appeared to be the same exact ride and we had other priorities on this visit). I chose this restaurant because they serve a perch sandwich and perch is a fish common to the area (so Jim told me, anyway). Again, it was my attempt to try the local flavors. Well, after spending about $80 on lunch, it turned out to be a bit of a choke. While perch is a mild white fish, and in this sandwich it is lightly breaded and fried, upon examination you can see that much of the “skin” is left on the fish in order to hold it together. Okay, skin on food just grosses out me and several members of my family. And before you ask, no I don't like fried chicken for the same reason. Skin…ewww…yuck, just get it away from me! Also, the tartar sauce was really lousy, tasting like mayonnaise more than anything else. At least the fries were good, and we had plenty of them, so I was still somewhat satiated. Besides, since the scaly fish skin grossed me out I had pretty much lost my appetite anyway! After lunch we headed to Toft’s Ice Cream Parlor to get dessert. Thankfully, the ice cream here is great, and the portion size is out of control. We ordered four double-scoop cups and shared. Probably could have ordered three, but hey, we needed the excess to recover from the lunch debacle. Our ice cream cravings gone, we headed back out into the park. 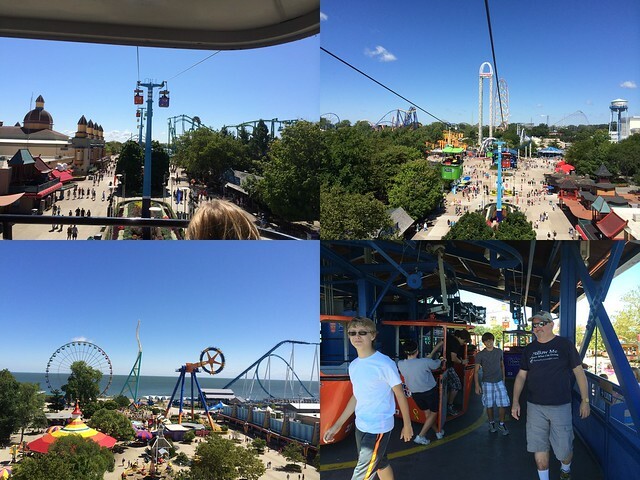 Everything in the GakeKeeper area was not operating (GateKeeper, Wicked Twister, Windseeker, and the Ferris wheel). Raptor was down as well and Blue Streak (old-school wooden coaster) and Calypso (a Huss Troika) both had long lines. So we headed to Cedar Downs. What a great attraction! This racing horse carousel is quite unique. Instead of horses going up and down on a spinning platform, they move forwards and backwards simulating the act of passing and being passed during a horse race. I found this attraction to be quite delightful, and something I would love to have at my home park. We had a great time hooting and hollering and cheering on our horses as we competed within our rows of four. Cedar Downs is a classic and should not be missed by any visitor, thrill seeker or not. After Cedar Downs, Mr. Koehl marched us across the park into the old Ballroom. (You’re not supposed to go into the Ballroom, but the door was open and no one stopped us, so, why not?) Here he told us some great stories about Cedar Point’s past and how the Ballroom, now just a place for conventions and Haunt cast members to assemble, was once the life-blood of the park and provided a great source of revenue during the lean years. I leave it to Mr. Koehl to flesh out these stories in a future Blog Flume post, but again, my love of the romanticized Cedar Point that once was continued to grow. Incidentally, Mr. Koehl also pointed out a door that leads from the Ballroom to the park’s operations offices. I thought about knocking and asking for an update on GateKeeper, but then came to my senses and tweeted the question (along with a picture of the door) instead. No response. After the Ballroom we headed past the kiddie area, Kiddy Kingdom. This collection of grocery-store caliber spinners needs to go. And Sir Rub-A-Dub’s Tub? Please! Never have I seen a lamer ride at such a prestigious park! Just rip it all out and put in one or two high-quality attractions that the whole family can enjoy. Maybe a dark ride or two? Cedar Point actually used to have a couple of dark rides (one called Earthquake and one called the Pirate Ride – maybe Mr. Koehl will provide an article on these two attractions someday as well? ), and regardless of how tacky they were, they would be welcomed with open arms by the Rao Family, I assure you! We zipped past Crappy…I mean…Kiddy Kingdom and went out to the Lake Erie beach where Mr. Koehl once again delighted us with stories of the park’s past, pointing out key sites along the way, and then taking us on a tour of the Breakers Resort as well. The renovations in progress are looking good, and from the video in the lobby about the project, as well as the artist’s renditions of the plans, Breakers is going to be the place to stay during a Cedar Point visit in the future. I look forward to the finished product. At this point, Mr. Koehl and his son had to leave for the day, so I took over the duty of leading the charge. 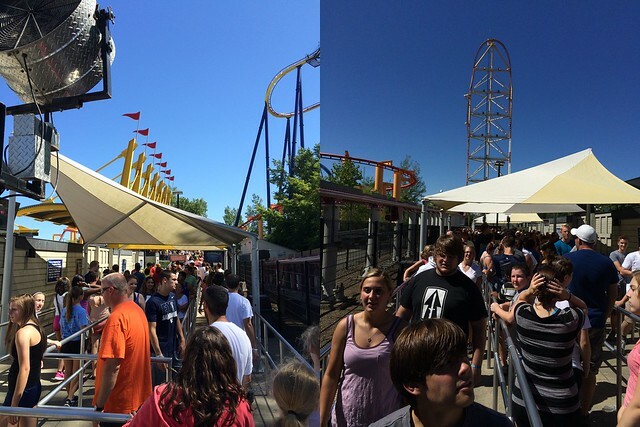 And, with Top Thrill Dragster “only” showing a one hour wait, we hopped in line. Ugh! What a grueling wait it was, made almost unbearable by the heat (and it was only in the low 80s), the lack of anything remotely entertaining about the queue, and the horrid intrusion of Fun TV blaring at every turn. I am not a patient man by nature, but I can put up with a lot when motivated. However, Fun TV combined with a ride throughput of about 960 people an hour (trust me, I clocked the ride ops…several times…what else was there for me to do?) and a hot, boring, excessively slow-moving line almost pushed me over the edge. What a nightmare. Doesn't Cedar Fair realize that while people are standing in line they are not spending money? Come on! Stop trying to sell Fast Lane Plus and start giving people a better all-around park experience. Get people out of the lines and into the shops and restaurants so the park can make some real profit. For those who think the Disney parks are expensive, buying a Cedar Point ticket and spending $80-$90 on a Fast Lane Plus wristband makes Cedar Point the more expensive one-day option! We hung tough and after about an hour we boarded and rode Top Thrill Dragster, wishing fervently for a rollback. No such luck. We got our 17 seconds of fun and we all came to the same conclusion: great experience, but not worth the wait. Exhausted and overheated, we moved on, crossing that coaster off our bucket list. Next up we rode Gemini again – blue train, as I mentioned earlier. It is a fun coaster when racing and when you have a willing partner for some hand slapping good fun in the other train. After Gemini, we hit the Cedar Creek Mine Ride and Mean Streak. The Mine coaster was very tame, maybe too tame. Adventure Express at Kings Island is a better coaster, and Thunderation at Silver Dollar City is even better still. As for Mean Streak, it wasn't nearly as painful as I thought it might be, but it was slow, and really not fun at all. A Texas Giant redo would be perfect for this Dinn Corp. woodie, so I hope it is on Rocky Mt. Construction’s list of upcoming projects. Incidentally, if you want to ride a painful wooden coaster, come to Worlds of Fun and visit the Timber Wolf. I promise you it is the most painful ride you will experience at any park in the United States. Score one for Kansas City, baby! We ate dinner at Famous Dave’s on the Sandusky Bay side of the park. Although it is a chain restaurant, it is a good one, and a favorite of mine. As a bonus, the prices at this location were only a buck or two higher than normal, so we got a quality meal for a fairly decent price. Service was good, A/C was good, and the rest from the crowds was an added boon. 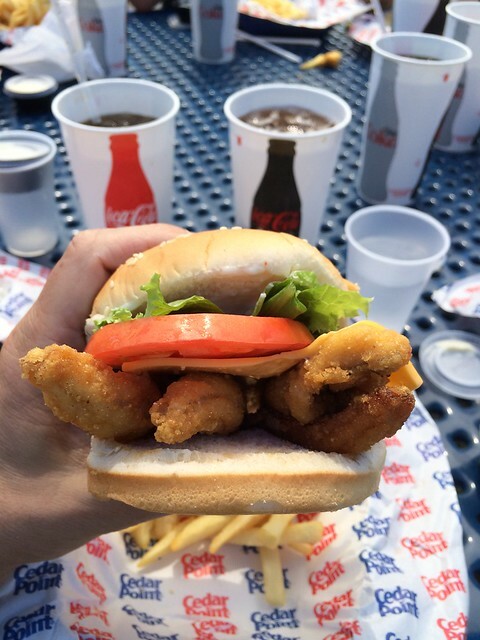 The Rao Family recommends a stop at Famous Dave's for those who visit Cedar Point and want to eat onsite. After dinner, we headed back into the park to finish our touring plan. We hit Blue Streak (fun, air time, starter coaster), Wicked Twister (short and sweet – gotta love the acceleration), the sky ride (classic, must-do attraction whenever you are in a park that still has one), as well as repeats on Magnum, Mantis, and a few others. Sadly, Gatekeeper was down all day today apparently due to a broken lift hill chain. I am really beginning to regret not riding GateKeeper last night when it was operational. While we have ridden a wing coaster previously (Wild Eagle at Dollywood), I was looking forward to the keyhole maneuvers as well as the overall ride length of Cedar Point’s latest record-breaker. 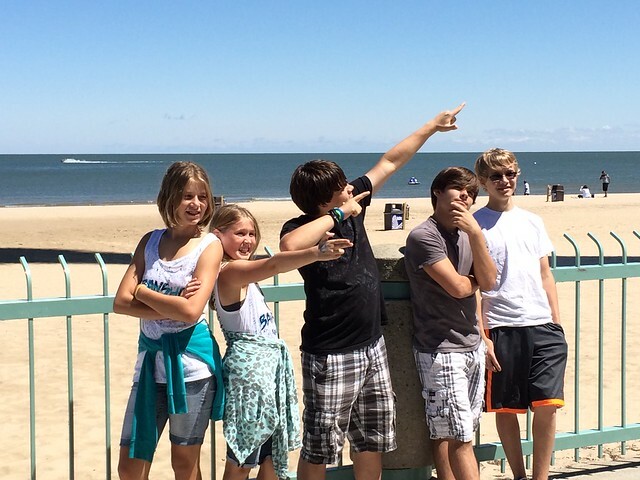 Oh well, if it is not up tomorrow, we can always visit Cedar Point again someday. Sometime during the evening I noticed that @CedarPoint tweeted out that the evening’s Platinum Pass Holder Evening Ride Time Event would be switched from GateKeeper to Top Thrill Dragster. Score! Sure, it would have been great to get multiple rides on GateKeeper, or any rides for that matter, but a chance to ride Dragster without a long wait seemed like a great opportunity. The park closed at 10pm with a few fireworks from the Luminosity night time show. Instead of watching the show (we’ll catch it tomorrow), we moseyed over to Top Thrill Dragster and waited with about 75 to 100 other Platinum Pass Holders. At 10:40, the event began and over the course of the next hour we rode this extreme coaster five times without a wait. Just hopped on, rode, jogged back around, hopped on, and rode again. It was wonderful. With no wait, Dragster becomes a terrific attraction, amazing in its ferocity and intensity. I can honestly say that after five consecutive rides, I was done. I did not need a sixth (though I would have taken it if there was more time). So while the day had its ups and downs, it definitely finished on a (wait for it) “high” note. Great recovery, Cedar Point. Kudos! We are now back at the hotel, exhausted. Massively long day. We will hit Millennium Force for Early Ride Time in the AM and hope for a GateKeeper return to service. Might catch a show or two in the afternoon, even hit the water rides, then bolt until about six and return for a ride of Magnum and maybe watch Luminosity. Will let you know, but for now, sleep! Tomorrow: We conclude with Part Five. Top Thrill Dragster: 0 - 120 mph in 4.0s, 420 feet straight up, and 400 feet straight down. About thirty seconds of total ride time, including the wait for the launch. 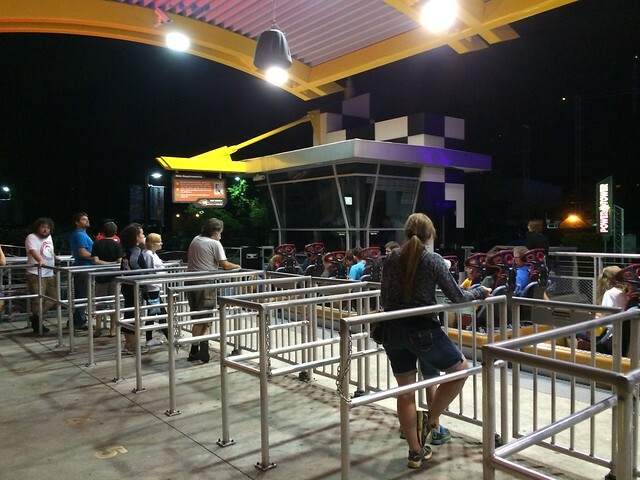 For your enjoyment, here are a few videos of Top Thrill Dragster in action when we visited. Top Thrill Dragster from the queue line. Top Thrill Dragster racing by during the Luminosity fireworks at the end of the night. Here's a video of the Platinum Passholder Dragster ride event - it's the Rao Family walking through an empty queue to the Dragster load house. (Incidentally, about halfway through the Platinum Passholder event, even the load house was nearly empty as you can see from my picture in the trip report). And, this last video was my final ride of the night... that's me waving my arms like an idiot in the back row. Those ballrooms were the big money generators for many an amusement park back in the big band era. That generation went crazy over dancing & big band music...Heh, too bad you spent $80 on that bad meal. That could have gone towards your special Rao fund for a two park Universal ticket so you can ride the Hogwart's Express next year. Just kidding. Sounds like you had a real fun vacation. Mr. Bill, oh no, not part five...LOL.......James: Great trip reports. Can't wait for the 2015 Universal/Disney report. Especially the Hogwart's Express trip. 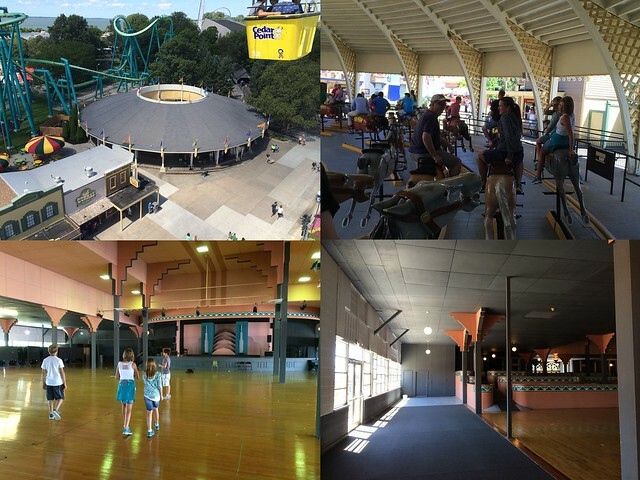 Vote of the Week: How many theme parks did you visit this summer?